Our Marron Glacés are 100% natural and free of any chemical treatments at source, and no additives whatsoever are used during the transformation process. The chestnuts varieties we use come exclusively from La Serranía de Ronda organic agriculture. The nuts are all selected by hand, to ensure only the best raw material will undergo the metamorphosis process that will raise them to Marron Glacé class. Steam pealed, the chestnuts are gently and patiently candied, one by one, into syrup and enriched with a thin, crunchy vanilla-scented glazing or icing. 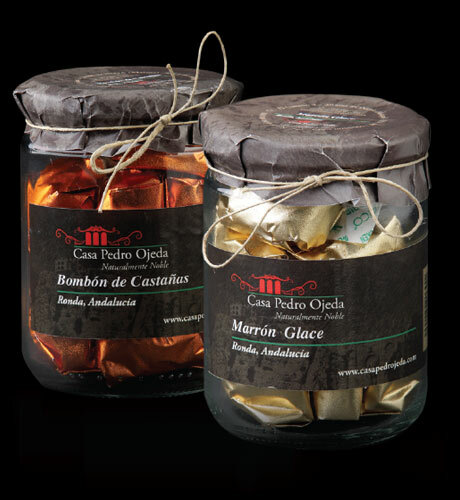 A process that takes more than 200 hours of dedicated perseverance, but fully justified by the noble character and divine taste of Casa Pedro Ojeda’s Marron Glacé.